Please click here to go to the PSA webpage, where you will find a link to the Pre-loved Uniform list and details of how to purchase/donate pre-loved items. The purpose of our uniform is to contribute to the business-like atmosphere of the school and create a sense of school identity. Tutors and teachers will carry our checks at the start of each lesson/session that the girls are presenting themselves appropriately for school and in accordance with the uniform code. 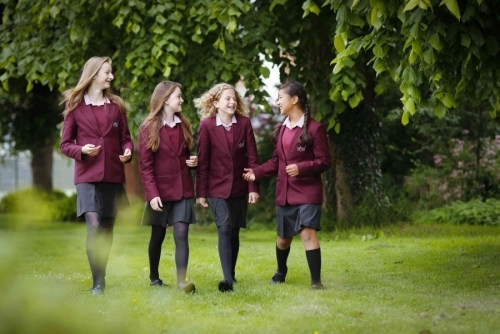 Core uniform items are detailed below and can be ordered directly from Trutex (see link) alternately contact Bateman's Stroud Telephone Number 01453 764320 for more information. Tights must be black or harrow grey - They must be thick and non-patterned - thinner plain/tan tights and grey, white or black ankle socks may be worn in the summer. The Physical Education uniform must be embroidered with the student’s full name on the burgundy shirt, with initials on the skort and shorts and with name tags on every item. The embroidery colour is plain white. At various times of the year we raise money for charity by holding non-uniform days, when students pay £1 to come into school in their own clothes. For a full list of uniform please view or download the documents below.